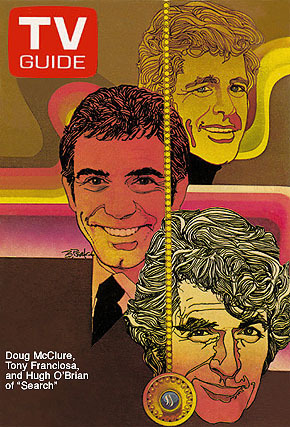 TV Guide cover with the stars of Search, Hugh O’Brian (lower right), Tony Franciosa (middle), and Doug McClure (top). Actor Hugh O’Brian died at age 91, according to an obituary posted by the Los Angeles Times. O’Brian was best known for starring in The Life and Legend of Wyatt Earp, a 1955-61 television series. But he also made a try at a spy-related show, Search, which ran on NBC during the 1972-73 season. Search concerned a private organization, the World Securities Corp. Its operatives were equipped with the (then) latest high-tech gear, including miniature cameras that enabled operations chief Cameron (Burgess Meredith) to stay in contact constantly. O’Brian starred in the two-hour TV movie pilot, titled Probe, as Hugh Lockwood, the top agent for World Securities. It was written and produced by Leslie Stevens, who had also created The Outer Limits television series. 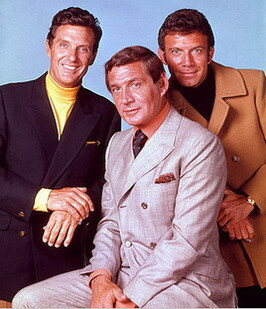 When the now-titled Search went to series, the format was changed so the show rotated O’Brian, Tony Franciosa and Doug McClure as World Securities operatives. Meredith, as the cranky Cameron, was the one constant. The initial day-to-day producer was Robert H. Justman, who had been associate producer on the original Star Trek series. Anthony Spinner, producer of the fourth season of The Man From U.N.C.L.E., was the story editor. Justman departed before the end of the season and Spinner, who was a veteran at QM Productions, took command. Meanwhile the show’s roster of writers includes the likes of Norman Hudis, Irv Pearlberg and Richard Landau, who had all contributed to 1960s spy shows. Search is available from Warner Archive. Here’s a preview clip of an episode featuring O’Brian. Search, a spy-ish series that lasted only one season on NBC, is now available on home video in the U.S. through Warner Archive, Warner Bros.’s manufactured on demand arm. Hugh O’Brian, Doug McClure and Tony Franciosa rotate leads as elite high tech espionage operatives for Probe Division of World Securities Corporation in this spy-sensational SF-flavored actioner… Each agent, dubbed a “Probe”, is wired up for worldwide surveillance thanks to their Scanners (miniature video cams) and dental/ ear implants. Tracking their telemetry and giving real-time mission advice is the team of specialists gathered together at Probe Control under the direction of the brilliant, irascible V.C.R. Cameron (Burgess Meredith). O’Brian plays Lockwood, Probe One, ex-astronaut and lead agent, McClure plays CR Grover, Standby Probe, brilliant beachcomber goofball and Franciosa plays Nick Bianco, Omega Probe, street savvy ex-NYC cop tasked with organized crime capers. The series was created by Leslie Stevens, who had created The Outer Limits. The pilot was a television movie called Probe, but either Warner Bros. (which made the series) or NBC decided Search was a more appealing name. Members of the production team had previously worked on the original Star Trek series and The Man From U.N.C.L.E. Robert H. Justman, who had been associate producer on Trek (and had worked on The Outer Limits as well) was producer of the first half of the series. Anthony Spinner, the fourth-season U.N.C.L.E. producer was initially the story editor and took over as producer. The price is $49.95 and you can find more information on ordering by CLICKING HERE.